Star Witness is being ridden and shown by adults and youth. She is easy going, does well in English and Western. She always places well in trail and has gone over cross rails. 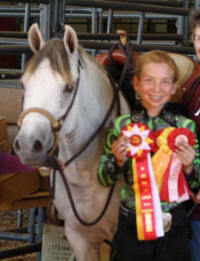 Lazy J Star Witness and Dannah Westbrook competed at the EXCA World Finals in the Youth and the Non Pro Divisions. They missed being in the top 10 by 0.9 of a point. Both girls and ponies did very well!